Tucson Daily Photo ~: YES, a bee hive but more of a holding cell! 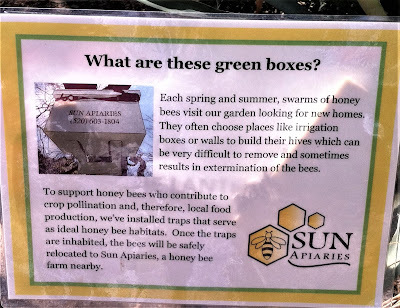 Yesterday's guesses about the Big Green Box at the Tucson Botanical Gardens were correct - YES, the box serves as a hive, of sorts. But its real purpose is to "trap" the bees and relocate them to a friendly environment at Sun Apiaries, a honey bee farm. Great idea and so good that it will help in stopping the extermination of the ones that set up a home in the wrong location. YES! I think this is a wonderful idea, too!